When winter arrives, you go on the ski slopes ... Yes but if this time you were trying something new !? 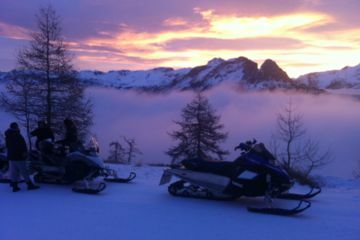 Join the guides of Snowmobiles Evasion and escape the crowd and the hustle and bustle for a moment of pure mountain! The Alpes de Haute Provence is a subtle blend of wild vegetation and raw mountain ... This beautiful landscape, bordering the Mercantour National Park, is accessible to all, regardless of your level of sport! The experience guides are there to accompany you and ensure safety all along your excursions! Far from the daily stress, the crowd, with family or friends, enjoy a unique moment to discover one of the most beautiful areas of the Southern Alps in the heart of the Ubaye Valley. Occasional sportsman, great sportsman come to discover the diversity of our guaranteed walks every day *: 2 Snowbikes YAMAHA WR 450F + Timbersled ARO 120 LE and 8 Snowmobiles YAMAHA Venture Lite 500 await you for a Morning hike, a Praloup Exploration, or the Trapper's hike with tasting under the tipi!